We feel like a broken record, but it was another wild weekend in college gymnastics! A number of attendance records went down, perfect 10s were scored and program records were tied or set all over the country. We wanted to show more love to the non-top teams in college gym in 2019, so we broke out our Dismounts into DI, DII (all USAG nationals-eligible teams) and DIII. Each week, we’re also dishing out a few superlatives for some of our favorite moments, looks and results from the weekend of competition. Below those, you’ll find your typical results and highlights from every DI women’s meet. Rutgers is coming for all your titles in a couple years, guys. So it’s time to get on board now. In this weekend’s meet, sophomore Belle Huang tied the program record with this stellar beam routine. Denver saw a lot of success over the weekend, breaking its attendance record, coming within three tenths of No. 1 Oklahoma’s score and with this routine from the sophomore. In fact, it was the first perfect 10 of the season from a team other than Oklahoma or UCLA. Often overshadowed by her teammates, the junior nailed her phenomenal and difficult beam routine—switch side quarter to Popa anyone?—for a meet-winning 9.950. You could have seen this one coming, but Ross’ perfect 10 vault was an obvious choice for stick of the week. It was also UCLA’s first vault 10 since Vanessa Zamarripa in 2013. The Big Storyline: Oklahoma was without Brenna Dowell after the senior took a scary fall on her bars dismount. Maggie Nichols was still limited to two events, but its 197.700 showing proved how deep Oklahoma is. Denver kept pace throughout the meet, being down as little as 0.175 after three rotations. Lynnzee Brown capped the meet off with a 10.000 on floor. Implications: Oklahoma retains its No. 1 ranking while Denver moves up to No. 6 and will appreciate having another score close to its season high 197.450 when the rankings switch to RQS. Records: Lynnzee Brown’s 10.000 on floor is a new career high. Denver also shattered its attendance record, drawing in 2,000 more fans than its previous high. Controversies: The meet was delayed due to a bars malfunction that had to be fixed before the teams started warmups. The Big Storyline: Auburn had a successful first rotation on bars that made it seem like the Tigers had a chance to take the meet, but Florida quickly caught up. The Gators posted the sixth best team score of the season with their win tonight, highlighted by another top performance from Trinity Thomas. Though Auburn ended up scoring a point lower, its individual event scores still proved it can compete among the best. Implications: Florida marched ever closer to the SEC regular season title by continuing its unbeaten streak in the conference. Auburn had no such luck, but the Tigers will likely maintain their ranking thanks to a solid team score. Records: Auburn’s Gracie Day competed in the floor lineup for the first time since the first week of the season, and her score of 9.925 was good enough to match her career high on the event. Teammate Skyler Sheppard earned a career high on the same event with a 9.875. Florida’s crowd size of 9,055 was among the top 10 in program history. The Big Storyline: This meet went on despite a historic snowstorm in Seattle, and Kyla Ross excelled to register the highest all around score of 2019 after scoring a perfect 10 on vault. The meet was a little chaotic with a number of unusual mistakes, but both teams ended up with solid scores thanks to strong floor rotations. Grace Glenn returned to UCLA’s beam lineup, but with a shakier-than-usual routine, while Anna Glenn was expected to compete bars but was pulled at the last minute in favor of Savannah Kooyman. Implications: Washington will drop a few spots to No. 18 while UCLA will remain at No. 3. Records: Kyla Ross set career highs on vault and in the all around. Her 10 on vault is UCLA’s first since Zamarripa in 2013. The Big Storyline: Cal wasn’t able to repeat its incredible 2018 upset of Utah, but it did put together a strong score despite a wobbly beam rotation. Freshman Maya Bordas set a career high on bars following a fall and won the individual title—a good sign for the freshman who is fighting to get established in lineups. Utah also had a wobbly beam rotation that held it back from a season high, but it was able to register a score that is about level with the rest of its 2019 season. MyKayla Skinner is still sitting out floor due to a minor ankle issue, but mentioned in the post-meet interview that she is expected to return to the event next week. Implications: Neither will see a major ranking change after this meet. Controversies: Toni-Ann Williams hopped in the middle of her acrobatic series on beam and likely did not receive credit for it. The Big Storyline: Given that LSU had lost to another beatable conference opponent (Auburn) earlier in the season, the idea that the Tigers could lose to Kentucky wasn’t entirely implausible going into tonight. But the thought that it could happen by more than a full point was an entirely different story, and such was what happened. Kentucky certainly had a home scoring advantage in its win, but it was still deserved; LSU did not show anything resembling its full potential, counting a bars fall and struggling with landings across the board. It’s mid-February, and the Tigers have a lot of work to do if they want to redeem themselves and claw their way up from what might be a fall in the rankings. Implications: Kentucky should climb from 17th after sitting there for a few weeks; the Wildcats are better than that, and tonight was an indication. Records: Kentucky posted its second highest team score in program history in front of a record crowd in Lexington. Junior Alaina Kwan scored a career high bars score of 9.850. For LSU, Bridget Dean and McKenna Kelley earned career high beam scores of 9.875 and 9.850, respectively. The Big Storyline: Both teams had a bit of a struggle getting into a rhythm tonight thanks to uncharacteristic mistakes from veterans, but there were plenty of shining performances. Arguably the best example of this duality was Georgia’s beam lineup, in which the Gymdogs saw both a fall from Sabrina Vega (on her mount, no less) and an event title from freshman Rachel Baumann. Georgia also had to count a fall on bars. 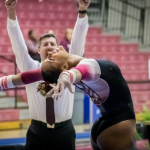 Missouri had a chance to catch up with its SEC opponent, but a difficult beam rotation, in which it counted two falls, tightened the gap to a detrimental effect. Implications: Georgia may see a slight fall in its ranking thanks to the success of other teams, but Missouri should expect a slight rise. Records: Georgia junior Rachel Dickson earned a career high 9.975 on vault for her stuck Omelianchik. As for Missouri, sophomore Gabrielle Gottula scored another career high with a 9.875 on beam, and Aspen Tucker put up a personal best score of 9.925 on floor to win the event. The Big Storyline: Alabama’s score was its lowest in a few weeks, but it will still be an acceptable road mark for the Crimson Tide as the season of RQS looms. Shining performances, specifically from its title winners, were a sign of even better things to come for the team. Competing at home, Arkansas definitely missed the presence of sophomore Sarah Shaffer, who was out for the week with a minor injury. The Razorbacks also counted a beam fall but still tied their second highest team score of the season. That will be little consolation until they start posting some higher ones, particularly when they return home. 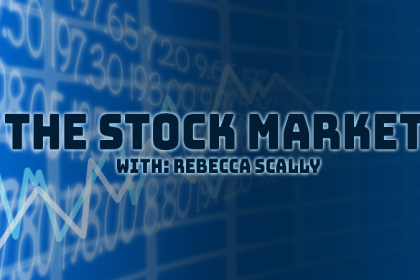 Implications: Neither team should see considerable movement in the rankings this week. Records: Alabama freshman Emily Gaskins won the bars title with a career high score of 9.925. 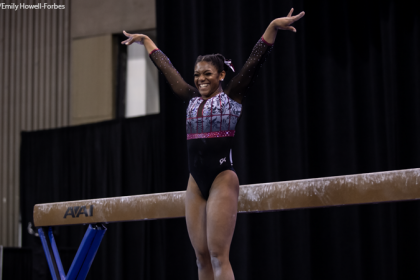 Arkansas sophomore Sophia Carter didn’t break any records, but she continues to be on a roll; she logged her fifth floor win in the first six weeks of this season, with four of them scoring 9.900 or higher. The Big Storyline: Both teams put together solid meets all around. Utah State tied its season high, and Boise State put up a respectable score. Utah State’s Makayla Bullitt received a score of 2.000 on bars, which typically indicates that the routine was stopped for some reason, sometimes injury. Implications: No change in the MRGC rankings; Utah State moves down to No. 33 nationally. Records: Utah State sophomore posted career highs on vault (9.800) and in the all around (39.225). The Big Storyline: This was a stellar outing for both teams. Michigan finally put together the sort of meet we’ve been waiting for with its superstar freshman class, and Iowa nabbed a season high on the road. It appears that Michigan’s Abby Heiskell is nearly back to form after having an appendectomy just before season, and transfer Anne Maxim is settling into roles on vault and bars. Having early routines like those, and ones from Maddie Mariani and Lexi Funk, putting up big numbers is what propelled the Wolverines over 197 this week. Iowa would have put up an even more impressive total but faltered in the final rotation and counted a fall on beam. Implications: Michigan remains undefeated in conference play, and sits atop the Big Ten. It will move up two spots to No. 8 nationally with this mark. The test for the Wolverines will be whether they can put up a big away score next week before RQS kicks in. Records: Both teams saw a plethora of career highs in this meet. The Big Storyline: Both teams had solid-but-not-exceptional days, and it was nice to see scoring return to normal for the Beavers after the insanity at home last week. Both teams had mistakes, but nothing devastating went on. Oregon State had some fantastic vaults, including sticks from Singley and Madi Dagen but also counted some shakier beam routines. Arizona continues to improve, excelling on floor and debuting a new 10.0 vault from Maddi Leydin. Implications: Oregon State will move to No. 12 nationally, and Arizona will stay at No. 25. Controversies: This meet lacked commentary, which was fine until the end when we cut to a woman with a microphone moving her mouth. It unfortunately seemed like she was talking for the whole meet, yet her microphone didn’t work. The Big Storyline: Minnesota stunned the Huskers in Lincoln after the Nebraska vault squad was forced to count a fall. Both of its first two vaults were falls; that said, the Huskers should be proud of becoming only the second team in the NCAA to put up six 10.0 vaults. We’ll see if they stick to the one and a halfs moving forward or decide to play some of the earlier vaults safe. Implications: Minnesota will be tied with Nebraska at No. 2 in the Big Ten, second to Michigan, the only other team that remains undefeated in conference play after Ohio State’s loss this week. Records: The Huskers put up several career high marks on bars. 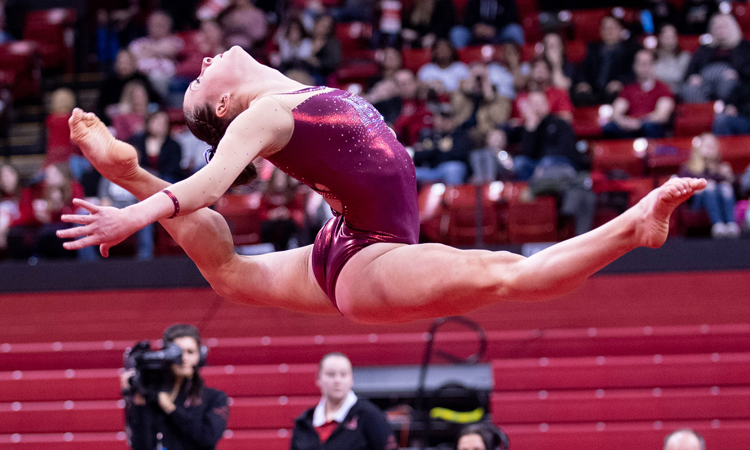 Controversies: Many people on Twitter argued that Lexy Ramler should have had a 10.0 on her beam set; though her set was stellar, she did hop on her dismount. The Big Storyline: Stanford… Why must you break our hearts like this? The Cardinal showed shades of brilliance tonight, and it looked at various times like they could take the meet, constantly bouncing back from mistakes with clutch performances. But it all came down to beam, and unfortunately it couldn’t keep it together after counting two falls. The season high scores on floor and bars (which was an especially solid event), however, were signs of good things to come. Implications: Stanford fell slightly in the rankings to 26th, but Arizona State maintained its place at 19th. Records: Arizona State’s Kaitlyn Szafranski scored a career high score of 9.925 on floor in the penultimate spot in the lineup. Freshmen Stephanie Tripodi and Jasmine Gutierrez also made their collegiate debuts on vault and beam, respectively, after performing in exhibition last week. The Big Storyline: This was like watching two different meets smashed together. The first half was wonderful. Both teams excelled on vault and bars, putting up clean sets with great attention to detail. Then the falls started. Both leadoffs in the third rotation fell. Ultimately, Maryland counted a major beam mistake, and Ohio State counted two falls on floor and one on beam. Good grief! On the up side for the Buckeyes, we saw Claire Gagliardi on bars for the first time, as well as Miriam Perez on beam and Danica Abanto added vault and bars in her all around debut. Implications: Ohio State will be frustrated with this showing. With Minnesota surging and Nebraska and Michigan holding steady, the Buckeyes will step back a pace in the conference. Maryland will hold steady with this season high, leading the bottom five. Controversies: The commentary in this meet was horrendous. BTN+ clearly does not prepare its announcers one bit. Names were wildly mispronounced, and skills were consistently misidentified (the best was a front toss being called a Gienger, or perhaps a Jaeger called a Yurchenko). This is not the fault of the commentator who was doing her best. BTN+ should not put people into situations where they are so utterly unprepared. Add it to the list of Big Ten television coverage failures. The Big Storyline: BYU proved that the 196s it has scored at home this season were not flukes, scoring its first road 196 of the season. Air Force also had a great day, besting its previous season high by a point. Implications: There were no significant ranking changes for any team. Records: Helody Cyrenne’s 9.950 on bars and 9.875 on beam were career highs. Controversies: Seattle Pacific had to brave flying out of Seattle in the middle of a historic snowstorm, and ultimately two gymnasts were left behind as the whole team raced from security to the gate. Those gymnasts were given a replacement flight, but it was cancelled for weather-related reasons. So the Falcons ultimately competed down two athletes and had to debut two new vaulters to fill the gap. The Big Storyline: This meet ended up pretty close after the Cyclones had some miscues on floor. Southern Utah put up a solid number on floor, an event it has struggled on this season, but will want to improve on beam after counting some low scoring hit routines in the 9.500 to 9.600 range. Implications: National and conference rankings for the two teams remain unchanged. The Big Storyline: In the third Big Ten conference upset of the weekend (after Ohio State fell to Maryland and Nebraska fell to Minnesota), Rutgers bested Penn State in New Jersey. Led by a career day for Belle Huang, it was a complete team effort on a very strong day for the Nittany Lions. Implications: Though Rutgers remains at the bottom of the conference, its average will improve significantly; it is the sixth team in the conference to hit 196; Maryland, Illinois, Iowa and Michigan State still have not. Records: This is the second highest team total in Rutgers program history. 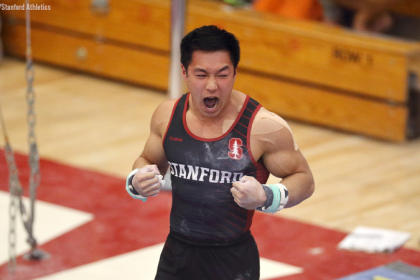 It’s first ever win over Penn State, and Huang’s 9.925 ties the program record on beam. This is Penn State’s highest road score since 2016. The Big Storyline: West Virginia was unable to build on its 196 from last week but hit 24-for-24 and swept the competition. Bridgeport recorded its third straight score over a 194 to finish second and less than half a point behind West Virginia. Penn recorded another score over 193, just shy of its season high from last week. Implications: There were no significant changes in the rankings for any team here. Records: West Virginia’s McKenna Linnen recorded a personal best 9.850 on beam and earned her first career win on that event. Teammate Jaquie Tun set a new career high on floor with a 9.925. Controversies: This is not a controversy per se, but Esperanza Abarca broke her streak of five straight 9.800s on bars, scoring a 9.775. Clearly one of the judges didn’t get the memo. The Big Storyline: N.C. State bested its season high by over a point to record a 196.350, the highest EAGL score of the season. Pittsburgh saw the return of Haley Brechwald to the bars lineup, a much needed piece after having to put up five gymnasts on that event for the last few weeks. Implications: Pittsburgh will drop one spot in both national and conference standings to 37th and fifth, respectively. N.C. State holds steady at 28th nationally and first in the EAGL. Records: Pitt’s Charli Spivey recorded a career high on floor with a 9.875. On bars, both Lauren Kent and Drew Grantham set career highs with a 9.900 and a 9.800, respectively. The Big Storyline: UIC’s 195 streak has come to an end. This was not a bad meet for the Flames, but they failed to get the late-lineup big numbers that have propelled them forward in other meets this year. Illinois State had an excellent night, highlighted by a strong floor rotation and title-winning late lineup routines on bars and beam. Sofia Iribarren and Mia Quigg have really settled in and are becoming important and reliable freshmen. Implications: UIC will be starting to get nervous about its lead in the MIC and USAG rankings after Lindenwood put up a 195.350, highs in both the conference and USAG. Illinois State will raise its average slightly and stay in the middle of the MIC. The Big Storyline: George Washington recorded a season high score to take the win over EAGL rival New Hampshire, as well as Yale and William & Mary. New Hampshire had a solid meet to finish second, led by a 9.925 on beam from freshman Hailey Lui. William & Mary struggled on bars and beam but recorded a season high score on vault. Implications: George Washington’s strong performance moves it up to 35th overall and fourth in the EAGL. Records: Yale’s 49.025 on beam is the second highest score in school history. The Big Storyline: After having to count falls in its last two meets, North Carolina broke back into the 195s to defeat EAGL conference-mate Towson. Implications: Despite its good result here, North Carolina drops one spot in national rankings to 34th. Towson moves up one spot to 55th. Records: North Carolina junior Mekyllah Williams set a career high on bars with a 9.800. This also marked her first event title. The Big Storyline: Alaska had a historic senior night, beating UC Davis for the first time since 2004 and finishing with the second-best team score in school history. It also set a program record on the bars that included four career highs and three scores that will go into the top 10 in school history. UC Davis had a challenging meet, counting a fall on beam and struggling to rotate tumbling on floor. Implications: Neither will move in conference rankings. Records: Alaska recorded the second highest score in program history and set a program record on bars by a margin of 0.250. The Big Storyline: This was a weird one. Rae Balthazor is out for the season with the ankle injury she suffered last week; the Illini were forced to shuffle around lineups again but had Mary Jane Otto back and in the all around. This team, usually a bars and beam squad, was strong on vault and floor and struggled otherwise. Karen Howell had a rough fall on bars, hitting the low bar on her pak salto, and sat out beam and floor. For Michigan State, the first three quarters of this meet went very well, but a tough beam rotation kept its total below 195. Implications: Neither team will see much movement in conference or national rankings. Records: Both teams put up a number of career high marks. The Big Storyline: This was a strong contest for both teams. Central Michigan put up its highest away total so far, something important while we look toward RQS, and Kent State bested its previous season high by nearly half a point. The Flashes have had some struggles this season and will feel confident after this solid home performance. The Chippewas’ Morgan Tong is continuing to prove herself as one of the best beamers in the MAC. Implications: Central Michigan will retain the No. 1 spot in the MAC by a hair; it will need to continue to produce big scores to fend off a surging Northern Illinois squad. Kent State will move ahead of Bowling Green. The Big Storyline: Northern Illinois continues to put up strong scores both at home and on the road. This is its fourth consecutive high-194. Underclassmen Morgan Hooper and Mia Lord have stepped into leadership roles on their respective events and are helping the Huskies build a solid season. SEMO on the other hand continues to struggle. This is a team yet to hit 190, largely due to bars. Anna Kaziska remains a highlight, and Alana Fischer made her all around debut after adding bars. Implications: Northern Illinois will fall just short of taking over the top title in the MAC after Central Michigan’s strong performance Sunday holds the No. 1 spot for the Chippewas. Records: The SEMO squad put up a number of career highs. The Big Storyline: Courtney Mitchell. As if taking three events and the all around title isn’t impressive enough, this is the highest all around total we’ve seen in USAG this year, besting the 39.225 she had previously put up and that Bria Northrop and Mikailla Northern have also reached. Mitchell led the Lions to the highest team total in USAG so far as well, topping UIC’s 195.250. So far, Lindenwood, UIC and Bridgeport are the only USAG teams to reach 195. Implications: Because Lindenwood and UIC face off not only in USAG but in the MIC as well, these teams are set up for a serious knock-down-drag-out battle in the postseason if this continues. Look for Mitchell, Northrop and Northern fight for all around honors as well. Ball State should hold steady in the middle of the MAC pack; this is its second highest score this season. Bowling Green struggled a bit and will see its average drop this week. Records: All of Mitchell’s title-winning scores are career highs; casual. Controversies: This was a diversity meet! We saw some amazing rainbow hair on Bowling Green Instagram stories. Truly spectacular. The controversy is that the Falcons didn’t get the huge press some other teams do for similarly themed meets. The Big Storyline: The Eagles had an excellent showing, putting up the third-highest total in the MAC so far, second only to two Central Michigan scores. Despite some strong performances, Western Michigan fell a bit short. Having Rachael Underwood back on beam after missing last week is a good sign, but the Broncos clearly need her on all four to perform at their peak. Implications: Both teams will hold steady in the conference. Records: Underwood’s beam total is a career high mark. The Big Storyline: Sacramento State showed signs of life to upset San Jose State and set a season high at home on Friday. Sophomore Jordyn Brent set a career high in the all around and won two events, and the Hornets were able to hit six routines on bars, an event that has been incredibly challenging in 2019. San Jose State’s depth troubles continue and counted falls on bars and beam did nothing to help the situation, but junior Chelsey Andrada’s amazing beam routine was a bright spot. Implications: Sac State finally moves up from the bottom of the MPSF, passing Seattle Pacific. Records: Brent set personal bests in the all around and on vault. Andrada tied SJSU’s school record on beam with a 9.900.